In 1994, the National Football League Players Association launched its "Rookie Premiere," a unique event among all the professional sports. The first major business and marketing event following the NFL draft, it's an opportunity for rookie NFL players to, as the NFLPA's official website says, "gain insights and make connections that will assist in the development of their personal brands and careers on and off the field." It's a very cool couple of days. It's the first time players get to see their official Nike jerseys, the first time they get to play as themselves in the popular Madden video game and the first time they pose for their very first Panini trading card, among many other activities. 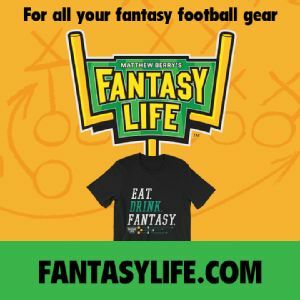 As fans of the podcast are no doubt aware, I have a company called "Fantasy Life" and that company is in business with the NFLPA. It is as a result of that relationship the NFLPA invited me to Los Angeles in mid-May. My friends at ACE Media were there with a terrific production crew and, during one long Saturday, I interviewed almost 40 rookies about real football, fantasy football and filmed some other surprises for both our upcoming Fantasy Football Marathon (returning once again to ESPN in August) and the second season of "The Fantasy Show." Meeting NFL players is weird, especially for me. First, understand that I am socially awkward in almost any situation, and this is no different. Some players play fantasy football and appreciate me, some don't play but know enough about the popularity of it to be polite, and some have no use for it and look at me like some sort of nerd leper. For the most part, the players are great. I've really enjoyed meeting them the past two years and I have to say, in addition to on-field talent, my overall impression is that this is a very special rookie class. I was really impressed by almost all of them. That said, understand players don't have to be nice, interesting or polite to have success in the NFL and/or to be a fantasy superstar. Last year at this time, I came away from this event really being impressed by Alvin Kamara, Kareem Hunt and Evan Engram. I also thought Mack Hollins was an awesome guy (he's still a deep sleeper for me this year). And, if I am being honest, I didn't come away from my conversation with Dalvin Cook feeling great about him and, of course, he was awesome last season while healthy. 1. With Frank Gore leaving Indy, there's a lot of speculation as to what will happen in the Colts' backfield. Will Marlon Mack become a workhorse or continue to be the situational back he was last season? I asked Colts fourth-round rookie running back Nyheim Hines if he had a chance to speak with any of the coaches about how they see him fitting into the offense. Hines got a big smile and said, "Yes. Kind of like the Darren Sproles of Coach Reich's offense. He told me he's gonna move me all over the field, run the ball, catch the ball. Hopefully I have some return opportunities." In 15 games in 2016 (his last fully healthy season), Sproles caught 52 passes for 427 yards and two scores, rushed for another 438 yards and two more touchdowns on his way to finishing as RB24 in PPR scoring that season. TMR: Ronald, is there an NFL player you admire or who you've tried to base your game off of? Jones: Jamaal Charles. I've watched a lot of his tape, back at Texas and with the Chiefs. Chris Johnson, when he was playing. I've studied him a lot. TMR: Some critics I have heard regarding your game is that they don't believe you can be a workhorse back in the NFL. And yet, you carried the ball at least 25 times in four of your final five collegiate games. What would you say to those criticisms? Jones: I'm working on that, becoming a complete back. You know, given the opportunity, I can carry the load. Obviously I'm working towards that, adding weight, but (he nods) I can be a workhorse. 3. I asked Calvin Ridley about playing under Steve Sarkisian, the Falcons offensive coordinator who coached Ridley as the offensive coordinator at Alabama in 2016. Ridley said, "I'm really comfortable, I know the formations and a lot of the plays really early. I gotta learn a lot more, but ... he installed a lot of stuff that I do know, so I'm at an advantage over a lot of other guys." 4. I don't know if Bills first-round quarterback Josh Allen can play at the NFL level, but man, he could not have been more charming or personable. When it came to football, he said all the right things ... gonna compete, loves AJ McCarron and Nathan Peterman, wants to do his best for the Bills, etc. But he was a very good sport with a lot of the goofier stuff we asked him to do for the show and it turns out he is a big fantasy football player. He's actually a two-time champ of his ESPN league with a bunch of buddies and I asked him who was on his team last year. Josh's fantasy tight end last year? Charles Clay. Pretty sure Allen will become the first fantasy player in history to draft a guy in fantasy football and then throw actual passes to him in the NFL the next year. I asked him if he had told Clay yet that he had him in fantasy football. He laughed. "Not yet. Didn't think it was the right time to talk to him about that ..." Made me laugh. By the way, Josh, never tell a player you have them in fantasy. 5. I don't have a great anecdote about Giants first-round running back Saquon Barkley other than the fact that he's the first rookie I've met who can describe what Jay-Z's house is like. "Exactly what you think Jay-Z's [house] is like. He has this view and an infinity pool. ... the whole place was just amazing." But as I said in a tweet afterward, prior to meeting Barkley, I had him ranked as my No. 5 running back and No. 7 player overall. After spending 15 minutes with him, talking about his process and how he is preparing for the season, I feel even better about that ranking. Playing in New York City is not an easy gig and he's as prepared and polished for it as anyone I've seen. Smart, thoughtful, humble ... could not have been more impressed with the young man. I spoke about him with a few Penn State teammates as well, and all raved about him. TMR: So, for fantasy football at ESPN, we have to project what we think every player will do statistically this season. I am going to read you the projection ESPN has for you and you tell me if we are too low or too high. TMR: 52 receptions, 657 yards, about four touchdowns ... are we wrong? Miller: Yeah, you got it all wrong. Miller: I always find the end zone. Four? That's too low. That's like two games for me. I just think I'm going to score at least eight touchdowns. He wasn't cocky about it or boastful. Very matter of fact. Like, it just is what it is. Lotta mouths to feed in Chicago and we'll see if Mitchell Trubisky can get him the ball, but I loved his quiet confidence. 7. Rookie seasons at the tight end position like the one Evan Engram had in 2017 are the rare exception, not the rule. But if a rookie tight end is going to do something noteworthy in fantasy this year, Dolphins second-rounder Mike Gesicki is certainly in the best position. We spent a lot of time talking about what it takes to be successful in the red zone. When I asked what he has heard from the Dolphins in terms of how they see him in their offense, he mentioned the red zone, of course, and smiled as he said this: "Coach Gase is obviously a genius when it comes to the offensive side of the ball. Creating mismatches and taking advantage of the matchups ... so I'm excited to get in that offense." 8. Speaking of Miami, one of my favorite interviews came with Dolphins fourth-round running back Kalen Ballage. When we did our NFL draft wrap-up Fantasy Focus 06010 podcast, I mentioned Ballage as an interesting late-round sleeper. I have a feeling he may not go in the late rounds by the time we get to late August. I am fully on board with him as one of my favorite later-round upside picks. I absolutely loved this kid. First, he is a massive human being. He's 6-foot-3 with a vise-like grip, so I don't know how he doesn't become their goal-line back right out of the gate. He is funny, smart and quick-witted. The press in Miami is going to love this guy. TMR: Kalen, at Arizona State in 2016, you caught 44 balls, but only 17 last year. Has anyone on the Miami coaching staff talked to you about how they see you and your role in this offense? Ballage: (Big smile) Absolutely. Y'all gonna have to find out on game day. I kept pressing him on an answer and he wouldn't budge. At one point, I told him I had said he would be a great goal-line back for Miami on the podcast. And his response was something like, "But that's a very narrow role. Don't box me in." And they way he said "don't box me in" was more like a "if you do, you'll look dumb" than a defensive, "hey, don't stereotype me." I don't know, man. If you just read the transcript of the interview I did with him, you'd say he gave me absolutely nothing and you'd be 100 percent right. And maybe he's a great actor or maybe he's just B.S.-ing me. All of it possible and maybe even probable, but I just think sometimes you meet people and you immediately know that person has "it." Kalen Ballage has it by the truckload. He'll be a mid-to-later-round pick for me in every draft I do this year. 9. I asked current fantasy football darling and Seattle first-round running back Rashaad Penny about his role on the Seahawks and what the team had told him about his role this year. "They told me that when I come in they are going to throw a lot at me. It's all about me picking it up ... to be a three-down back, I gotta work on pass protection. It's a work in progress right now, but we're working on it every day in Seattle." It helped to confirm what we've expected since they drafted him, but it was good to hear they are making pass protection a focal point so he CAN be on the field all three downs. Also, I read him his ESPN projection (which is fairly generous to him). With the exception of Anthony Miller, most rookies I read their projection to dodged it or underplayed it by saying some version of "I don't know ... just gonna try to do my job." Penny just smiled and said he thought it sounded pretty good to him. 10. Coming out of college, I don't believe anyone questioned the talent of Redskins second-round running back Derrius Guice. Many scouts had him as the second-best back in this class after Barkley, and a lot of mock drafts I saw had a mid-first-round grade on Guice. But then there were some mysterious "character" concerns about Guice that arose during the draft and he slid toward the end of the second round before Washington finally took him with the 59th pick. So I thought it was very interesting that every time I saw Guice during the event he was surrounded by his fellow rookies and appeared to be the life of the party, laughing, smiling and clearly a favorite of this year's rookie crop. And when we sat down together, I quickly got it. He has an infectious personality, he's quick-witted and full of smiles. He was honest with me about his disappointment in dropping as far as he did in the draft, but also how determined he is to prove folks wrong. He was everything I hoped he would be and a lot more. I spoke with some of his LSU teammates about him and they all raved. It's early, of course, but so far he has done everything right as a rookie in Washington. He is already becoming a fan favorite and I believe it will only grow once games start. I will be accused of being a homer and I get it. But whether I get the call right or wrong, I actually think I'm pretty fair on Redskins players in terms of my analysis when it comes to fantasy. Anyway, just know this: After talking to him in real life and seeing how others respond to him, I'm all-in on Derrius Guice this year. ALL. IN. There will be a lot more from the rookie premiere in the coming months, but in the meantime I want to thank the NFLPA for a great event and thanks to all the players for being such good sports. Matthew Berry, The Talented Mr. Roto, has a burner account @FieldYates. He is the creator of RotoPass.com and the founder of the Fantasy Life app.